Allegri tries out a new diamond system with Juventus with huge emphasis on diagonal movements. Olympiakos nearly steal points from the game with goals against the flow of play, but Allegri’s men managed to use their new and interesting system to come from behind and secure 3 points in the Champions League. This game witnessed the emergence of a 4-3-1-2 shape for Juventus. Many aspects of this system ultimately brought out the best qualities of Pirlo in offense, as most systems with Pirlo try to do. Pirlo remained in deeper areas and used the space created for him to play his high quality long range passes. He played with the game in front of him and the movement of his teammates ahead of him provided many passing options. During goal kicks for Juventus Pirlo would drop between the central defenders to create a line of 3. Olympiakos reacted with a quite aggressive 3-4-3 in such situations. Maniatis would move inside with Dominguez and Mitroglou to form a front line of 3 while the right fullback filled Maniatis’ spot. Afellay and Olympiakos’ two central midfielders man marked Juventus’ 3 remaining midfielders. This left Lichtsteiner as an open pass for progression. Masuaku was very quite and aggressive in pressing Lichtsteiner, but in the end had too much space to cover in order to reach stability so Juventus frequently easily escaped these pressing attacks. 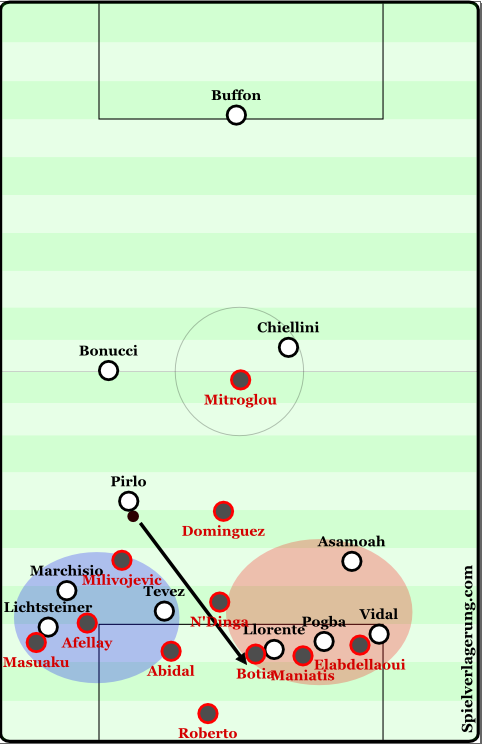 Pirlo loved to attempt his first-touch long diagonals in behind the defense if Olympiakos were unable to pressure him into facing backwards and allowed him to receive the ball (which happened frequently). Overall Olympiakos was very uncoordinated in their pressure and Juventus was able to easily find spaces to progress through. For example, if the ball was played wide a wide midfielder would press the ball, but with no support from his other midfielders to cover and balance him. Allegri’s men even entered into the midfield a few times from their fullbacks and played diagonals. This lack of coordination also translated to the Greek’s offensive play. Maniatis would move into the defensive halfspace while the right full back overlaps and Dominguez comes to support. During these movements the spacing between players and movements were poor. They were either too close and almost ran into each other, or too far and not giving support. Though they did have moments where they were coordinated quite well and exposed Juventus’ defensive instability. For Allegri’s men the fullbacks both pushed on very high. Both strikers moved aggressively and quickly toward the ball-near side and made diagonal runs in behind the defense. Probably in order to be able to play crosses into the box afterwards. Marchisio supported the play in midfield by offering a switch-option and never moving too high to the point he was disconnected from play. Pogba moved very high and acted almost like another striker a lot of the time. But Vidal had the most interesting role. Vidal would balance the aggressive near side runs by both strikers with diagonal runs on the far side of the field if the situation allowed for him to receive the ball on such a run. If his teammates weren’t quite able to move the ball and find a free player who has time to play a longer pass, Vidal would stay on the ball near side and play just behind the strikers while Pogba stayed quite high in the left halfspace. During the building phase when Pirlo dropped into the defensive line, Vidal would move into the vacant left defensive halfspace in order to support the buildup play. Later in possession during the creation phase, Vidal would then move away from the left side as Pirlo progresses up the field in order to overload the left side and provide the deeper creative outlet. If the ball moved towards the right side Vidal would stay on the right side rather than move away because Pirlo mainly operated on the left. As you can tell, Vidal had roles on both the right flank and in the left halfspace. Such a difficult role to fulfill both technically and physically, but if there is a player who can do it – it’s Vidal. Pogba had moments where he would drop off from his high position as well. This was mostly when Vidal did not move back to support the play in the left halfspace. These moments in particular where the brightest for Pogba. Most of the time he acted simply as a switching-destination, but he also caused probably the best chances in the game from this slightly deeper area. He received the ball and dribbled many opponents before getting fouled infront of the box for Pirlo’s free-kick goal. He also had a scene where he flicked a ball into Morata before Tevez was play through in a 1 vs. 1 chance. His high role was probably in order to create space for Pirlo while also contributing to the left-side overload of Juventus with his excellent technical and combinative abilities to penetrate the defense. 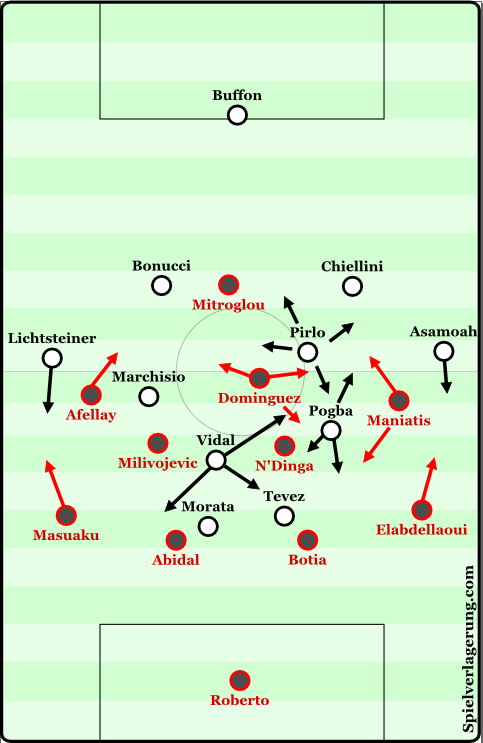 Juventus’ build up was largely down the left side and the other scenes resulted as synergetical side-effects off of the buildup on the left side of the field. Juventus’ diamond in defense was very unstable. In fact, immediately after scoring a goal they conceded one because Olympiakos exposed the poor coverage/support within the shape. The goals did not result directly from this, but caused set pieces which were scored from. Allegri’s 3 central midfielders spread wide to cover the field horizontally while leaving Pirlo alone inside. Vidal and the front 2 tried to block the progression from defense but didn’t offer much past that point. Olympiakos players would move wide and expose the isolated 8s of Juventus and create game from there. Even though it isn’t much, Pirlo wasn’t even able to quickly shift across such a large space most of the time to support his midfielder. At that point it would still be one 2 midfielders in the general area unless they delayed the attack some more. Maniatis and Dominguez managed to overload the right side with their teammates and open up a teammate to play a switch into the far-side halfspace into the completely free Afellay who wasted a great chance. Juventus were unable to gain access to the ball defensively and were manipulated quite easily. Though for most of the game Juventus weren’t without the ball and Olympiakos weren’t competent enough to expose such instabilities. Pirlo’s reaction to the first half. 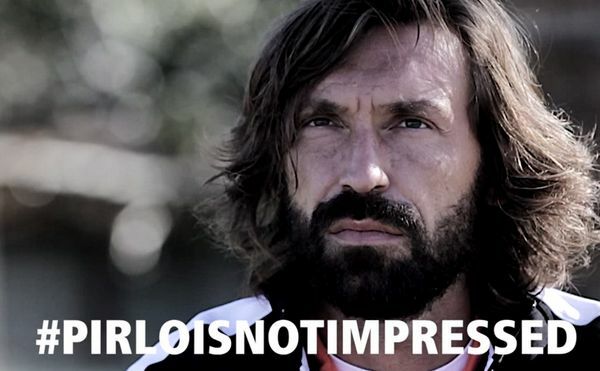 Pirlo was not impressed with the game in the first half. Juventus managed to lose a 1-0 lead and went behind 2-1. But Allegri made some excellent improvements and his men were able to push themselves back infront. In the second half of the game Vidal was made to play a higher role and had less of a job dropping back to support the play. Pogba was now playing a bit deeper as well as Marchisio. During the creation phase Pogba would move more centrally behind the strikers while Vidal stayed high around the strikers. This allowed Pogba to have a higher influence on the creation of the attacks before they reached the box and Juventus already looked much more dangerous. Throughout the game Juventus attempted many chipped balls to the forwards and looked for them to combine through the defensive line. They also played low sharp passes into the forwards’ feet diagonally from wide areas, where most of the build up was occurring. Juventus’ offensive structure leading to the goal. Juventus supported their switches of play much better in the second half as well. In the first half the ball would be switched to Lichtsteiner and his only direct support would be Marchisio and situationally Vidal. Because of this, Juventus’ attacking passes were mostly long diagonals towards the far post or through balls towards the corners due to the strikers’ runs coming from the center and moving diagonally outside. Due to Pogba’s new role in the second half he was able to support the underloaded areas attacking play much better and Juventus looked more in control over the entire width of the pitch. This coupled with Marchisio’s more supportive role allowed Juventus to switch the ball, but also attack more dynamically towards the goal after the switch. They would also start dribbling diagonally at goal or combining through the defense towards goal for a shot or a cutback cross attempt. Llorente’s equalizer came from a switch of play by Pirlo who then received the ball again because Juventus were able to maintain possession on the underloaded side and move more defenders to that side. Once Pirlo received the backpass he had time to curl the ball into Llorente (who along with his teammates formed a 3v3 at the far post) for the goal. Juventus had many more great chances to score goals and probably should’ve won the game comfortably. This might’ve been the case if they were able to defend in a more stable fashion in their new 4-3-1-2 shape. Even though it was a tight game, it will be interesting to see how the Old Lady develop defensively and offensively if they choose to continue in this new system. It looks quite interesting and promising. On a different day, this could’ve been a blow-out in Juventus’ favor, but Olympiakos deserve some praise for being able to keep the game tight until the late moments.